Most of us have diagnosed ourselves or family members at one time or another. In some ways it's inevitable. At times, because we feel inconvenienced by seeing doctors, or too embarrassed, many of us resort to simply treating ourselves. The results of a survey of 186 neurologists who attended the Texas Neurological Society Winter Conference in 2005 seem to confirm this. Nearly 48 percent responded to the anonymous survey: Over the prior 12 months, more than 50 percent had written a prescription for themselves and 79.8 percent had treated their own family members for acute conditions. Of those who described self-initiating medication, 25 percent reported self-diagnosing or self-treating migraine without consulting a physician; 21 percent used triptans, and 15 percent used migraine preventive medication. The results will be published by Randolph W. Evans, MD, and Richard B. Lipton, MD, in this month's Headache. Although common, is self-prescribing the most prudent course of action? While some argue that we are in the best position to recognize our own ailments, others suggest that it is inadvisable and even potentially harmful due to a propensity, under these circumstances, to throw conventional rules out the window. Indeed, several past studies have indicated that when physicians get sick, we disregard the advice we routinely give patients. Consequentially, we risk misdiagnosis or poor outcome. A survey of 1,476 Norwegian physicians with a response rate of 70 percent confirmed this effect and revealed that 13 percent of the physicians had negative experiences with self-treatment (Scand J Pub Health 2002;30:125–132). I experienced my own lesson in self-care years ago when I was suffering from an intractable sinus infection, or so it seemed. Too busy to go see a doctor, I placed myself on one course of antibiotics after the other. I finally stopped when I developed pseudomembranous colitis – a condition, my gastroenterologist pointed out, which has a higher incidence among physicians. It seems that physicians tend to self-treat more frequently those conditions that fall within their field of training. Most neurologists say that they will go to doctors when needing an opinion outside our specialty, but that they feel comfortable taking care of neurological problems on their own. In the Headache survey, 70 percent reported that they would be likely to self-diagnose and treat migraines which were not severe; 19 percent, new-onset frequent headaches; 48 percent, chronic daily headaches; 44 percent, Bell's palsy; 35 percent, acute lumbar radiculopathy; and 3 percent, transient ischemic attack. Cincinnati neurologist James J. Anthony, MD, a migraine sufferer since age 10, often prescribes triptans for himself and other members of his family. When his 24-year old son recently developed a left frontal headache absent other symptoms or fever, he attributed it to a migraine. Abortive therapy was unsuccessful and over the following week, trials of topiramate and valproate also failed to work. “He was miserable,” recalled Dr. Anthony, who arranged for an MRI, which revealed a serious left frontal sinus abscess. After hospital admission and treatment with intravenous antibiotics, his son recovered. 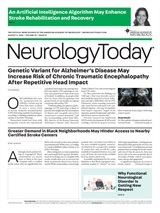 “It was scary, and a reminder, that we as neurologists need to be vigilant and that, when it comes to family, we may not be willing to consider the worst,” Dr. Anthony reflected. But at times our knowledge puts us in a position of being able to figure things out that would not have been possible during a formal visit. Jackson, TN, neurologist Karl Misulis, MD, PhD, credits his wife's good health after surviving ovarian cancer to a healthy lifestyle and use of supplements, both bottled and natural. A gardening enthusiast with a PhD in biochemistry, his wife selects items to grow based on usefulness as well as beauty. But when she became increasingly fatigued last summer and experienced intractable gastrointestinal distress, Dr. Misulis worried about a recurrence of cancer. While the subject is controversial, Lawrence K. Altman, MD, author of Who Goes First? The Story of Self-Experimentation in Medicine (University of California Press, 1998), suggests that the willingness of an investigator to undergo an experiment could be considered an application of the biblical golden rule to medicine. “I have a billion stories about prescribing for myself and my family,” Dr. Flaherty responded when I asked. “In fact, your question reminds me that I need to update my daughter's pediatrician about an experiment I tried (with his permission) using single dose prednisone to keep an upper respiratory infection from triggering her Henoch-Schoenlein purpura.” Although Dr. Flaherty is more inclined to try novel treatments on herself than others, she nevertheless checks with her doctor first. “The treatments are not dangerous, just unusual,” she said. When she had to appear in a BBC documentary shot outdoors last January, she was concerned about her tendency to shiver violently with even minor temperature drops. “I didn't want to shake like a leaf on international TV,” she explained. Knowing that anesthesiologists use clonidine or meperidine (Demerol) for post-op rigor – and acknowledging that meperidine did not seem ideal – she took 0.05 mg of clonidine while they were setting up the cameras. “I did not shiver, but I had a strange feeling of spreading serenity, not like sedation,” she recalled. After a literature search on the psychiatric effects of clonidine revealed that the drug suppresses rage behavior in rats, she is considering it to help a patient with refractory essential tremor and rare but dramatic attacks of anger. Although Dr. Flaherty is grateful to the doctors who have allowed her to tinker with her problems, she admits that she has had her share of flops. The most notable was a trial of naltrexone for dermatitis, which she based on the fact that endorphins can cause pruritus just as morphine does. It cured her itching, but caused nausea, yawning, diarrhea, and myalgia. “I felt like a heroin addict must feel withdrawing,” she said. Neurology Today also heard stories of neurologists treating their pets. After Michael I. Weintraub, MD, was told by the local vet that there was nothing to be done for his 13-year-old German Shepherd who had weakness of the hind legs, Dr. Weintraub gave him high-dose steroids out of sheer frustration. To his dismay, the treatment failed, and the dog developed Cushing syndrome. Perhaps the most unusual tale was offered by Joseph D. Weissman, MD, PhD, from Decatur, GA. About 10 years ago when the family pet iguana was failing to thrive, a veterinarian diagnosed retained eggs. (Apparently, captive iguanas do not automatically lay their eggs, causing them to often get stuck.) The vet had also caused a pathological fracture in the iguana's leg, so Dr. Weissman was not receptive when she suggested a bilateral salpingectomy and oophorectomy, nor was he pleased when she said the iguana would not survive long. So when he read in a book on reptile medicine that iguanas often respond to pitocin injections, he, along with his wife, Barbara M. Weissman, MD, a child neurologist, took matters into their own hands. Rather than using reptile pitocin, which is very expensive, they used large doses of human pitocin. After injections of five vials, the iguana laid about 5 eggs at once. “She has to be injected in the back of the neck, for reasons related to patterns of lymphatic drainage and so that she doesn't bite us,” he explained. “My wife and I repeated this procedure for a few years avoiding surgery, and now 11 years later, the iguana is still alive,” Dr. Weissman reported. Self-experimentation for research – whether for self or for family pets – is a tradition among many physicians and the stories abound. Those who prescribe for self or family should take note of AMA guidelines, however. They urge caution, but do not prohibit this practice, except in the case of controlled drugs. Neurology Today6(20):19-20, October 17, 2006.